In the midst of a strength building and run durability block I want to give you a better understanding of the exercises I’m doing as well as the entire program itself. Feel free to adapt these movements to suit your personal needs. The goal is to build strength and power in our lower half without added muscle mass. Looking at the hex-bar deadlift, it’s important that we focus solely on the lift rather than bringing it back down to the ground. This builds strength in the muscle without destroying it enough to promote muscle growth. Here’s what the form should look like. Because we’re looking to increase our power, we pair the heavy deadlifts with five explosive box jumps immediately each each set. This again promotes strength in our quads and hamstrings without the added muscle mass. The box jumps need to be max effort, so set the box as high as you can make it. If this is too advanced, standing broad jumps or simple explosive jumps straight up and down work just as well. I tend to agree. But if you’re in the “I can’t jump” camp, start with the explosive vertical jumps and progress from there. 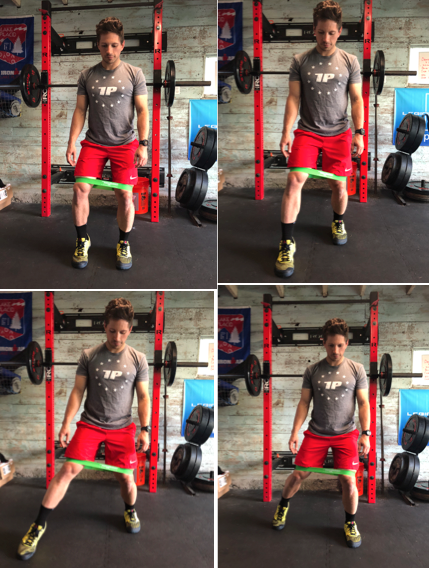 Once we’re finished with the deadlifts and box jumps superset, we focus on more power-based exercises to help strengthen our glutes. Our glutes are important for many reasons, but most notably at the end of a triathlon when everything is fatigued. Your glutes need to be able to withstand the constant pounding in the final leg of a race. The next block of exercises helps with that. We do Bulgarian split squats, front squats, and hamstring curls. On the split squats, focus on keeping your upper body as vertical as possible. Don’t slump your shoulders. Front squats are a personal favorite of mine. Here’s where form becomes uber critical. You want to keep your elbows up as high as possible. Shoulder mobility could be a hindrance here for you. If that’s the case, simply cross your arms on top of the bar. This will ensure that the bar is resting across your collarbones/chest and not supported by your arms out in front of your body. The downward movement requires you to push your hips back to drop into the squat. I’m a firm believer that you should go beyond parallel to get as deep as possible, though some might disagree. Push your feet through the floor on the way back up. We wrap up the accessory work with hamstring curls. I use sliders when I’m working out solo, but if I have a workout partner that day we’ll hold each other’s ankles and slowly drop our upper bodies to the floor. Once the accessory work is finished, we focus on single leg exercises. This helps improve balance and stability. Working these types of exercises into a strength routine is essential. Being stable improves our cycling and running form as prevents it from deteriorating as we fatigue throughout a race. The stability exercises are standing hips cars, bench step-ups with high knee, and turkish getups. Standing hip-cars utilize a band around the knees and making a box step with our feet. This improves our glute strength as well. The step ups with a high knee works on balance and forces you to engage your obliques. These muscles are quietly working in the background while your cornering turns on the bike and running with powerful strides towards the finish line. Turkish get ups are a complicated movement as there as several steps to focus on. This exercise will take some practicing before it feels fluid. Next week I’ll share the mobility exercises myself and the SENS Fitness triathletes incorporate into our weekly routines. We focus on ankle, shoulder, and hip mobility for obvious reasons. When a deficiency is present in anyone of those areas it’s important we address it now in the off-season. Our bodies are great at adapting to our movements even if we’re moving improperly or doing something out of balance. Our bodies will compensate for this and only increase the deficiency. Aside from making ourselves more susceptible to injury, we generally don’t notice it until it becomes bad enough to injure us. We’ll run and run and run using bad form without pain because our bodies have adapted to our poor form. Mobility exercises, as well as the stability movements explained here, will help correct those imbalances and promote quality form in all three phases of triathlon.